The Four of Cups. Luxury. Comfort. Apathy. Indulgence. Self-Absorption. Lack of responsibilities. Being care-free. The Four of Cups corresponds to the Sefirot of Chesed; stability, growth, condensation. It is the appearance of matter, where the energy of Cups finally fully comes to solidity. When the joy of fulfillment, emotional ease, and happiness come to solidity and existence, it manifests itself as luxury; an ability to enjoy life for its pleasures, to indulge in it, to be comfortable, and not have a care in the world to bring about negative emotions. Luxury is a very nuanced card, and unlike most of the other fours, and has both powerful positive and negative aspects. On the positive side, Luxury indicates “Hakuna Matata;” a no worries, carefree attitude, where everything is supplied for you and you have no responsibilities. It represents comfort emotionally and physically. However, often with these things comes degrees of indulgence, apathy, and self-absorption. This card represents a stable emotional and physical life, but at the same time serves as a warning to not let yourself get caught up too greatly in these comforts. 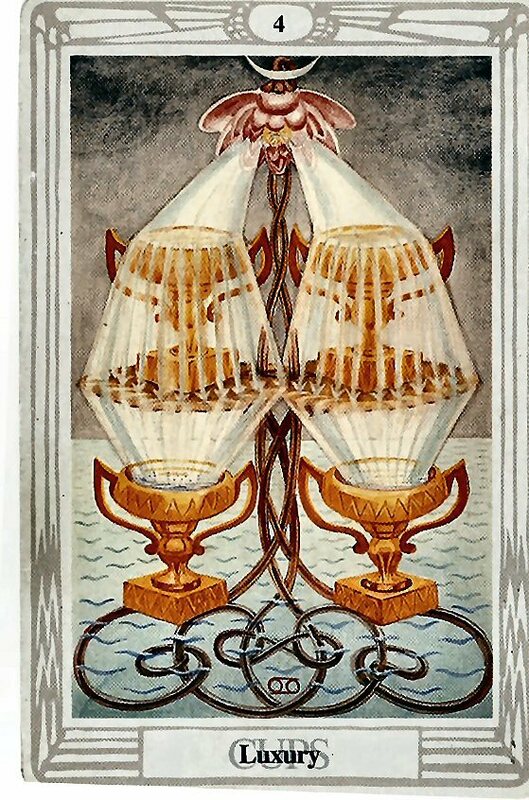 The energies of the suit of Cups become material in this card, and show themselves as the ideas of the suit of cups, but more grounded. A sense of community turns into the more realistic and often seen case of self-absorption, happiness becomes comfort and to some extent apathy, and surplus and abundance become luxury and indulgence. The intersection of emotional abstract and some semblance of the material world is not always pleasant, and in many ways this card represents this disconnect. The Rider-Waite art shows a man sitting beneath a tree, seemingly meditating, while a cloud with a hand holding a cup out to him floats by his side (mirroring the art of the Ace). This card most clearly shows apathy and self-absorption, focusing on those as its primary attributes; the shifting of emotion away from those around you and towards oneself. The Thoth art shows four cups receiving water from a flower (like Abundance), but unlike its predecessor, none of this water is wasted; it all flows into the bottom two cups. It is important to realize, then, that this card does not represent over-indulgence or too much luxury; that concept comes later. Rather, this card just represents the pleasurable aspects of indulgence and self-absorption; but its darker colors serve as a foreshadowing and ominous warning. In a reading, this card asks you to examine the roles that self-absorption and apathy might be playing in your life, as well as how indulgence shows itself. It tells of comfort and luxury present, and a lack of real responsibilities that allows you to be emotionally at ease. Reversed, this card asks you to look at how these energies might be twisted or distorted, or hidden in your life. Does someone you know have a carefree attitude on the surface, but instead is a churning mass of hidden emotions? Is luxury and physical comfort present, but emotional comfort absent? Do you enjoy your life, yet always feel a sort of guilt about living it?